Moon rise and set times are the first major update due first quarter 2012. Previously I’ve been studying Meeus’s “Astronomical Algorithms” and just recently started reading Montenbruck and Pfleger’s book “Astronomy on the Personal Computer”. The later has a nifty quadriatic interpolation method for determining rise and set times. Updating the shower summary description: there is room for improvement in summarizing the predicted meteor shower conditions. The current version does not account for the predicted peak time in relationship to the local observers sunrise or sunset. I’d like to expand this summary to provide people with more guidance. Part of the problem is related to the duration of the meteor shower. If one had some type of full width half maximum value for the major showers this would be helpful. 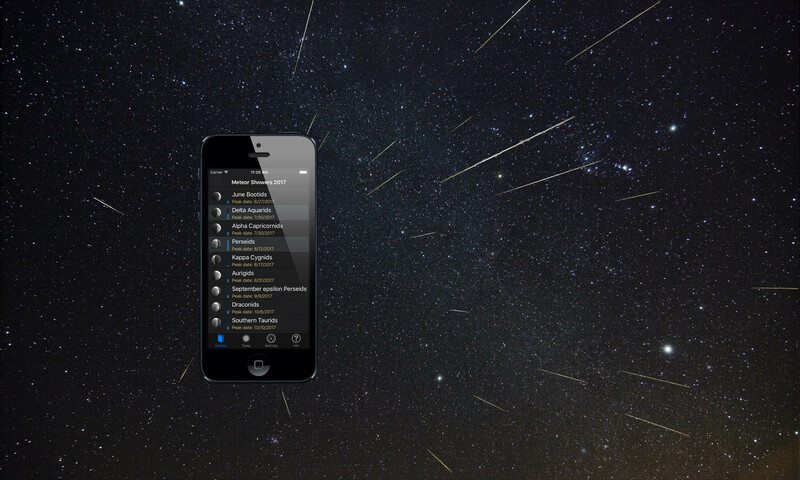 A iPad specific version of Meteor Shower Guide. While still in the planning stage this is likely to include a bit more meteor shower information and at least one new visual feature. One thing I’ve been considering from day one, but have no immediate time table for, is a simple database to record the meteor showers I’ve watched. This would be kinda neat if the users of MSG wanted to share that in some kind of online map. As always I welcome any comments or feedback.